In a little coffee shop in one of the most dangerous places on earth, five very different women come together. SUNNY, the proud proprietor, who needs an ingenious plan – and fast – to keep her caf and customers safea YAZMINA, a young pregnant woman stolen from her remote village and now abandoned on Kabul’s violent streets a CANDACE, a wealthy American who has finally left her husband for her Afghan lover, the enigmatic Wakil a ISABEL, a determined journalist with a secret that might keep her from the biggest story of her lifea and HALAJAN, the sixty-year-old den mother, whose long-hidden love affair breaks all the rules. As these five discover there’s more to one another than meets the eye, they form a unique bond that will for ever change their lives and the lives of many others. Everyday language; easy to understand. Good read, nice little book of fiction based very much on the author’s own experience. Characters could have been more developed. Found them to be black and white. There was political issues as well as the religious aspects told by the book, somewhat naïve. Customs – way of life told; the plight of women. Favourite character by far – the sixty year old Halajan, Afghani wise woman and mother to Shmet – the young man who changed his thinking and married the lovely Yasmina who gave birth to a girl child after her husband had been killed. At that time in Kabul it was extremely controversial! All in all a good quick read. 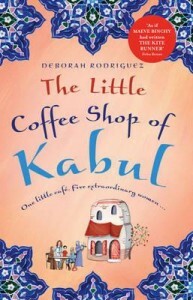 This entry was posted in All, Book Reviews, Fiction and tagged Book Groups, Deborah Rodriquez, Parramatta City Library, The little coffee shop of Kabul by admin. Bookmark the permalink.